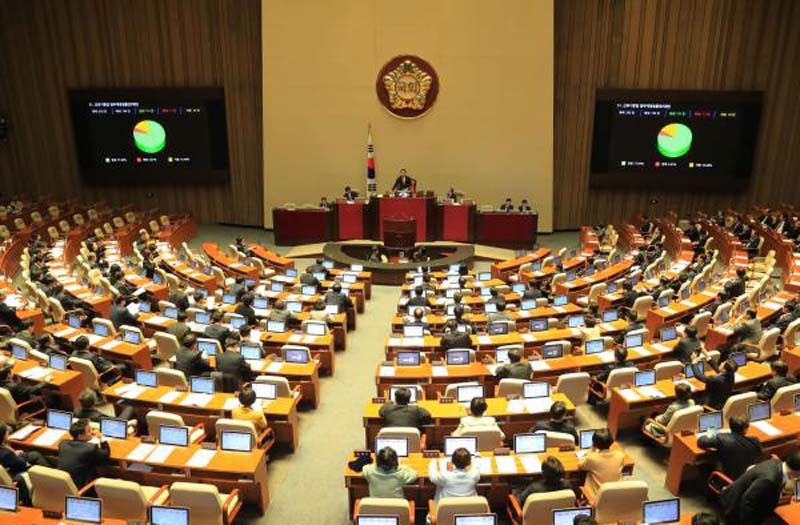 South Korea's presidential office has urged the country's lawmakers to quickly revise the law on national referendums in order to allow a public vote on amending the Constitution in June. [post_ads]Presidential chief of staff Im Jong-seok said Wednesday that without amending the referendum law, which was declared unconstitutional in 2014 for restricting voting rights of overseas citizens, the government won't be able to gather public opinion on major security-related decisions, JoongAng Ilbo reported. The top office has been pushing to fast-track the National Assembly's motion to revise the Constitution, in time to hold a public referendum alongside the local government elections on June 13. President Moon Jae-in has stressed that all political parties must keep their pledges made last year to hold a simultaneous vote, which would save taxpayers money. He submitted a government-drafted reform bill last week, as a means to stir lawmakers into action. While his liberal Democratic Party decided to adopt the document, opposition parties have objected to the "unilateral" move from the top office, as well as what they see as "socialist overtones" the revision bill. The main opposition Liberty Korea Party announced its own revision proposal Tuesday, with starkly different changes regarding the presidential power structure. The party, which holds 116 seats in the 293-seat parliament, also declared it would push for a referendum in September. The Democratic Party holds 121 seats. Im criticized the opposition Wednesday, saying it cannot vow to amend the Constitution while refusing to cooperate on revising the referendum law to make it possible. April 23 is the deadline to amend the referendum act, if the national vote on the Constitution is to be on election day. Moon plans to send a letter to the National Assembly this week urging for the revision of the law.